What scenes do you imagine they will remake for Re:coded HD? As we all know coded/Re:coded is considered the black sheep of the Kingdom Hearts series, not having too much importance to the overall story besides a few plot points I love the game and think it has quit a bit of importance but that is definitely a subjective view, but what do you imagine they would make into cutscenes? I honestly hope they don't follow with Days' example and actually make some scenes that take place in Disney worlds into cutscenes. Just adding descriptions between scenes will really kill the narrative and considering the lack of interest most people have in coded, it wouldn't help keep the audience engaged. If anything, this time around they should make it into an actual movie with some flow rather than the disjointed cutscene design they went with in Days. Riku: How's it looking, Sora? Sora: Is that... Riku, is that you? So far, things have been pretty quiet. Riku: Well, don't expect them to stay that way. One of the bugs interfering with the link is in Olympus Coliseum--I'm sure of it. And you know where it'll be hiding. Find the Keyhole. If my findings are right, that'll take you to the world's core. Get rid of whatever's harming the core and the rest of the bugs will be purged with it. Sora: Yep, that's what me and Mickey figured, too. Okay, be back before you can say "bug spray." Riku: Bug spray. Hang on, Sora. Did you know you have access privileges to worlds you've already debugged? Sora: You mean I can go back and visit? Riku: Basically, yes. Technically, no. You'd be accessing an emulated version of the world's data. The emulator gives you some degree of control over the data. For example, you could start the whole experience over from scratch. 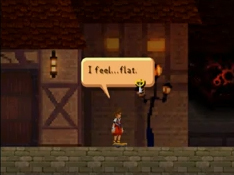 Sora: Uh, Riku. Why would I want to do that? Riku: I know, why fight the same enemies again? But what if I told you you might find some new adversaries? You did a good job repairing the worlds, but there may still be bugs lurking in the system sectors. Sora: Okay. Maybe I'll go take a look. Due to the shortness of coded I'd actually like them to add disney worlds as well kinda more along a constant movie rather than theater mode and please, PLEASE, add some sort of fight scenes! I'm sure I'll think of more scenes later, but one scene they could definitely expand upon is the one in the ending when Data-Naminé shows both Data-Sora and Mickey the dangerous memories. Instead of still images of the tormented characters, they could actually use painful scenes from the other games to underline the severity of the memories like i.e. Terra watching Eraqus disappear and such. And I would like to see how they would do the System sectors. They can't really do what Days did, seeing as Days was a more of a linear narrative through the whole system of "day 1, day 2" etc so I hope that everything will be made into cutscenes. Can't really see it exceeding past 2 hours though. It'd be interesting if they did a few variations of the Castle Oblivion floors, since you could achieve different outcomes. I really liked the interactions between Sora and Alice in Re:coded, especially because it was something we really didn't get in KH1 so I'm hoping to see that remade for 2.5. Oh, and every scene that has Namine. Every scene! That would be interesting. Maybe it changes every time you view it, and one trophy is "View every possible outcome for Castle Oblivion"
have yen sid stroke his beard as much as humanly possible. Oh yes, that was nice in Coded but I imagine they can make it look even more beautiful in the HD collection. Chaser, I expect a thread about trophies in 2.5 whenever you come back online. It would be really nice to get a new opening instead of a compilation of past scenes. Or at least incorporate the data effects differently rather than having them spiral out from the center. Oh geez. I'm not making one for a LONG time. More Riku scenes in general, y/y/? I have no doubt that they won't remake this scene, but the scene before the Data Roxas battle will be intense, when he's screaming about showing Sora what real hurt feels like. I think itll really just be the fmvs, since the rest is mostly filler compared to the remade scenes in days.